Jenny's London Ontario : What a great building. Pity it's not ours. What a great building. Pity it's not ours. What an attractive old building. 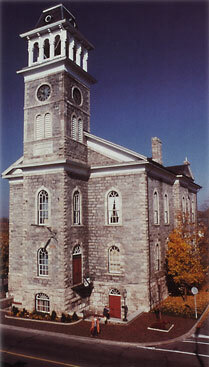 Designed by architect H. B. Sinclair and completed in 1858 in the Italianate style, it was once considered one of the most attractive public buildings west of Toronto. A bell was added in the 1860s and a clock came along in 1897 to commemorate the Diamond Jubilee. It isn't falling down. It's been intelligently renovated. It's actually being used, not neglected. It doesn't have a glass tower protruding from its centre and it hasn't been landscaped with flourescent metal trees. You guessed it - it's not in London. It's Cambridge's Historic City Hall, once the administrative centre for Galt. In 1981 Cambridge moved its municipal offices to another location. City Council and committee meetings are still held in part of this building, but it was renovated in 1990 to become the home of the Cambridge City Archives as well. That's right, a city archives, in a community smaller than London (120,000 as opposed to 350,000). In a city that's only officially existed since 1973. In a renovated heritage building, not an expensive, purpose-built eyesore. This building now holds paper records for Galt, Preston, Hespeler, and the modern city of Cambridge. Historic elements have been preserved while incorporating needed changes for accessibility and conservation. How did they do it? Well, obviously many of the movers and shakers in the City of Cambridge liked their historic City Hall enough to restore it for continued modern use. But an interesting fact is that the renovation was paid for in part by Toyota Canada soon after the company located a plant at Cambridge. I'm not sure what percentage of the final restoration bill Toyota paid, but there's an obvious lesson here for London heritage activists: a corporate sponsor could be asked to alleviate some of the costs in transforming one of our older buildings into a much needed archives.